R. and I stopped by PURE Cafe for a quick bite a few nights ago. PURE Cafe is located inside the PURE Athletex Sportsplex in Wexford (formerly Winwood Racquet Club), but it is open to public and not just gym members. It is also a bit hidden if you don't know where to find it, but it's basically off of Neely School Road, up Lake Road which is marked as a private drive. Considering its proximity to I-79 and such Wexford "landmarks" as Soergel Orchards and T-Bone Market, it is actually a good option if you're in the neighborhood and looking for a quick bite that is also inexpensive and healthy. PURE Cafe is a pretty unique place and nothing like a typical cafe. There are actually three businesses in one if you will, with the cafe being one of the three components of the business. As soon as you walk into the cafe, you will notice that the counter area where you place your order shares space with the second concept of the business, a Pro-shop that sells sportswear and athletic equipment. The third part of the business is called "The Bottle Club" which offers locker rentals inside a cooler for storage of beer and other alcohol. 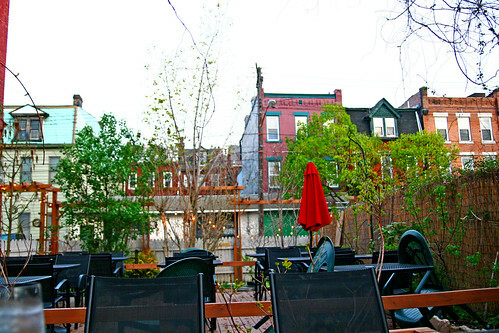 The seating area in the back consists of just a handful of small bar tables but it walks out to a gorgeous patio. 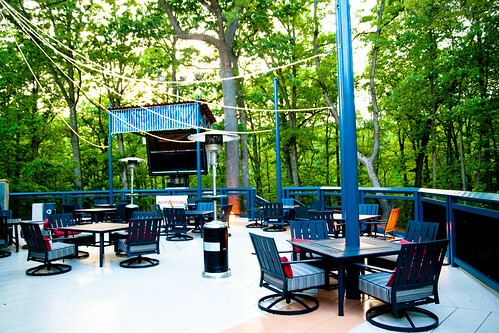 Because the weather was so nice, R. and I decided to take advantage of the patio seating which overlooks a serene heavily wooded area. There wasn't anyone else around, so we were able to enjoy the relaxed atmosphere and the peaceful chirps of the wild birds. It felt like we were having a picnic at a park, only with food made for and brought to us. 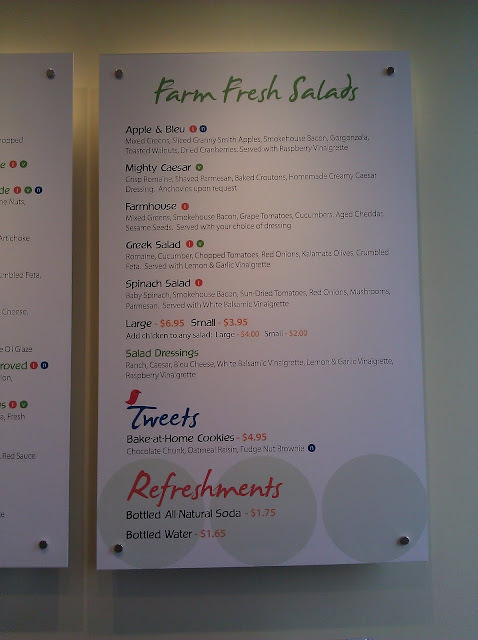 Not surprisingly, being associated with a fitness facility, PURE Cafe's menu also caters to gym-goers, as reflected in their selection of healthy salads, wraps, paninis, and crepes (OK, that last one may be a tad less healthy), as well as a large selection of smoothies with boosters like "Energy" or "Whey Protein." 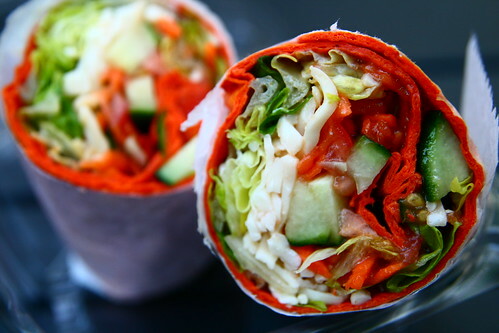 Aiming for something light, I decided to try the Veggie Lover's Wrap, with romaine lettuce, carrots, cucumber, tomatoes, and mozzarella cheese, in a sesame ginger dressing and a roasted red pepper wrap. It was a pretty standard combination of veggies, which was not particularly mind-blowing (not that I expected it at a cafe inside a gym), but everything from the veggies to the wrap itself was fresh and the dressing was an excellent complement to the veggies. As I said, PURE Cafe is a place for a cheap and quick bite, and for $4.50, this is exactly what you get, and it is of much higher quality than fast food. Because I can never say no to crepes (health priming be damned! 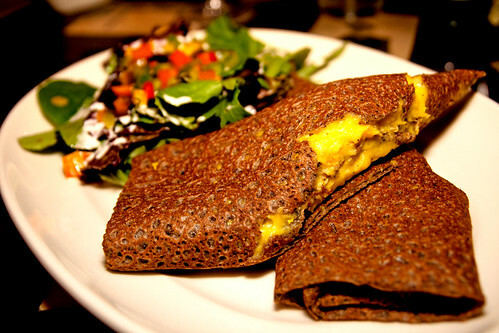 ), R. and I shared a Hazelberry-Anna Crepe for dessert. It comes with strawberries, bananas, Nutella, and topped with whipped cream. Again, pretty standard but pretty decent. The one thing I probably should have tried but didn't was their smoothies. Given their massive selection of no less than 25 flavors of smoothies, it seems like something they are probably good at. There is always next time, I guess! On another note, PURE Cafe has a drive-thru window, which seems a bit ironic considering it is at a gym, but I do appreciate the convenience, and the cafe does serve fresh brewed coffee and iced tea so I can imagine that the drive-thru window would come in handy for some. In sum, I liked PURE Cafe. It is simple, fresh, healthy, inexpensive, and the setting is beautiful. I can see myself bringing my Kindle here next time and read while I "picnic" on their patio. As I have mentioned in my previous blog posts featuring Burgh'ers and BRGR, I am quite picky when it comes to ground beef. I had sworn off beef burgers for almost two years, and am thrilled about the recent gourmet burger trend in Pittsburgh because for the most part these new restaurants serve beef burger that I consider "edible." Burgatory Bar had been the next burger joint on my list to visit (they serve hormone-free beef burgers that are especially ground for them daily), and I was excited to finally have the opportunity to pay them a visit this past week. Burgatory is located in the Waterworks Mall in Aspinwall, near the cinemas. Waterworks is a large strip mall that's a bit out of the way for most Pittsburgh folks, and one might never have guessed that such a cool burger bar decided to open its doors here. I missed out on getting a spiked shake when I visited BRGR so I was ready this time around. I went for the Monkey Business, a "Bananas Foster Shake spiked with Dark Rum and Banana Liquor," with little bits of banana inside. It certainly tasted as good as it sounds! I was impressed. 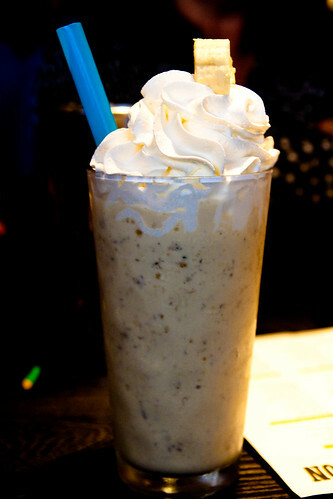 In addition to their spiked shake options, there are also "virgin" shakes and a number of beer and cocktail options. As for my burger, there were several options on the menu that sounded mouth-watering, including the Phat Patti's Veggie Burger (a ground cremini mushroom burger), the Buffaloed Bison Burger, and The Crab Shack (lump crab burger topped with Sriracha remoulade and creamy coleslaw), but as part of my quest for beef-I-can-eat, I had to go for the Morty's Steakhouse: "Peppercorn Crusted Beef Burger with Horseradish Cheddar, Haystack Onions and Cabernet Sauce." The burger was really, really delicious, and certainly deserves all the hype it has received. 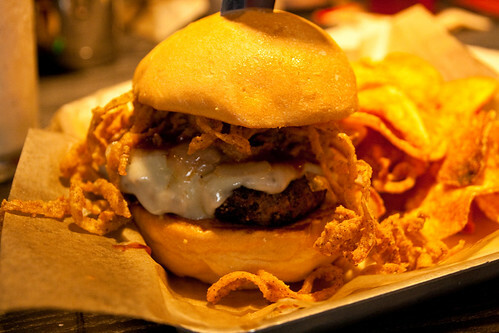 The patty was flavorful without being dry, and the crispy onions added an interesting element. I had a bite of R.'s Phat Patti's Veggie Burger and it was tasty as well. I should also add that if none of the menu options grab you, you can always create your own burger. Several people in our group did just that and they seemed to appreciate the freedom to do so. For your side that comes with the burger, however, I might recommend getting the fries instead of the chips. Overall, I enjoyed my burger and my shake at Burgatory Bar. I hesitate to make a choice among Burgh'ers, BRGR, and Burgatory and call it a winner, as I think you can't go wrong with any of these places. BRGR and Burgatory, in particular, are very similar on many levels, although BRGR does not offer the option of customizing your own burger, but it does have a trendier feel. Burgh'ers, as I mentioned in a previous post, is more of a casual neighborhood joint, and does not serve alcohol, although you are welcome to BYOB. However, of the three, Burgh'ers is the only one that serves grass-fed beef. 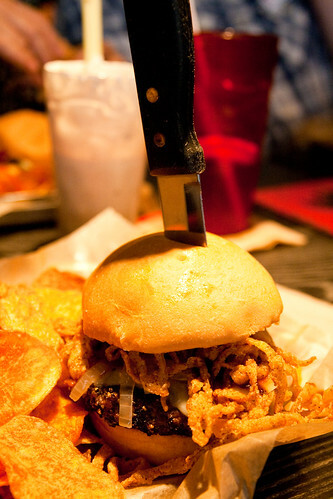 I think the next stop on my Pittsburgh gourmet burger tour will be Winghart's Burger & Whiskey Bar. Bite Bistro had been on my wish list since the day before it even opened, so I was excited to finally get the chance to try it out last week. Housed in the former Vivo space in Bellevue (which is to reopen in Sewickley soon), Bite Bistro is owned and run by the same family. The restaurant space isn't huge but it is very comfortable. On this Wednesday night, they easily and helpfully accommodated our large group of 13. Their menu changes depending on season and availability, and you can find the menu of the day written on the chalk board along one of the walls. 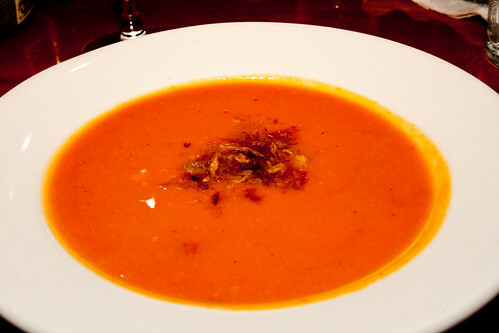 I started with the soup of the day, the Sweet Potato Bisque, which was well-spiced and absolutely delicious. One of the best sweet potato bisque I've ever had! 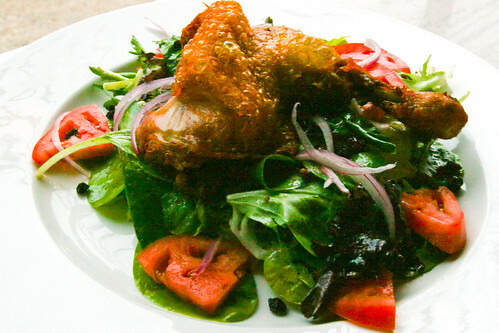 For my entree, I decided to try the Chicken Confit Salad. with fried capers, dates, and dressed in a lemon vinaigrette. I do apologize for the low quality of the photo; it looks like I had the wrong setting on the camera so my photos didn't turn out so great on this visit. :( I guess I will have to come back again for better photos next time. But, the chicken was cooked to perfection, and while the salad doesn't look like much in the photo, it was actually very tasty. The lemon vinaigrette was beyond amazing. Because I went with a large group, I also got to try bites of what other people ordered, and every single dish I tried - the Pork Fat Fries, the Grill Vegetable Salad, and Chocolate Pot de Creme - was delicious, which I think is a rare accomplishment. Bite Bistro is basically the kind of place that has it all: Amazing food all around, fabulous service, and a pleasantly easy-going atmosphere. Bite Bistro is also a BYOB establishment with a small corkage fee, and there is regular live entertainment as well. All in all, I loved Bite Bistro, and would highly recommend it to anyone. Update 6/18/2011: A second post on Bite Bistro with more photos and commentary. Update 1/22/2012: And a third post on my visit during Pittsburgh Restaurant Week. 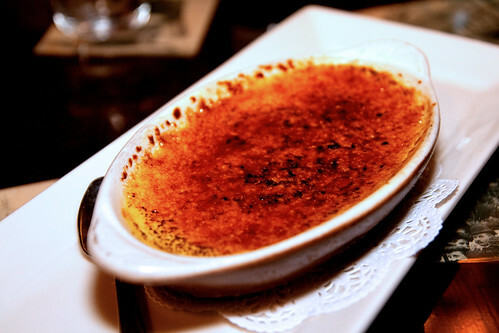 Braddock's American Brasserie, located inside the Renaissance Pittsburgh Hotel downtown, is a special place for R. and I, if somewhat serendipitous. A few years ago, before I even knew I was going to move to Pittsburgh, we were going drive through the Pittsburgh area and decided on a whim to spend New Year's Eve here. We stayed at none other than the beautiful Renaissance and had a fantastic and memorable time. Braddock's did not exist then - the space housed a different restaurant by the name of Opus, I believe. So soon after moving to Pittsburgh, when I noticed a Groupon deal for Braddock's, I went for it because the menu looked good and I figured it would be a good introduction to Pittsburgh, without realizing that it was located right inside the Renaissance. Eventually, I did discover this fact, and R. and I thought Braddock's would be the place to visit in January for our fifth "dating anniversary." It turned out to be the best meal I had had in Pittsburgh thus far, and I am just not saying that because I was motivated to like the place. Braddock's menu has a distinct European flair, and between the two of us, we shared the Braised Short Rib Pierogies, the Bruschetta with goat cheese and red peppers, a (very substantial) half order of Mussels, the Onion Soup Gratinee, the Housemade Potato Gnocchi & Lobster, and the Profiteroles for dessert. Everything was absolutely delicious, the service was attentive, and the atmosphere was fabulous. It was simply the perfect place to celebrate a special occasion. In fact, I enjoyed Braddock's so much that I had instantly declared it one of my favorite restaurants in Pittsburgh. Unfortunately, this first visit took place during my pre-blogging days, so I don't have any photos to share. However, R. and I did go back last week to celebrate another special occasion: one year pre-wedding. We were seated once again at one of the semi-circle booths with black leather seats looking out to the chic lobby, and as luck would have it, we had the wonderful Christina as our server again. We struggled a bit to decide what to order, as we wanted both to have what we had last time and to try something new. So, we compromised and went for a couple of our earlier favorites but also tried some new dishes. One of the most memorable dishes we had during our first visit was the Braised Short Rib Pierogies, so we just had to get it again this time. The second try certainly didn't disappoint, either. The pierogies are fried, which reminded me of Chinese pot stickers, in a good way. I think I actually prefer them prepared this way. 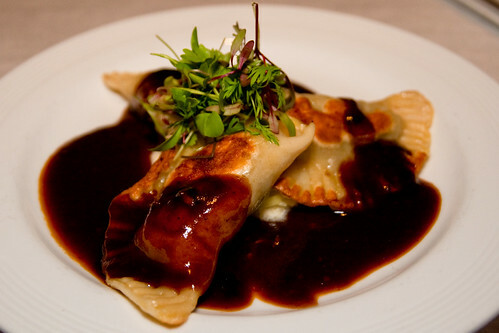 And while the pierogies are good on their own, the flavorful sauce is really the icing on the cake. For something new, R. wanted to try the Jumbo Lump Crab Cake appetizer. 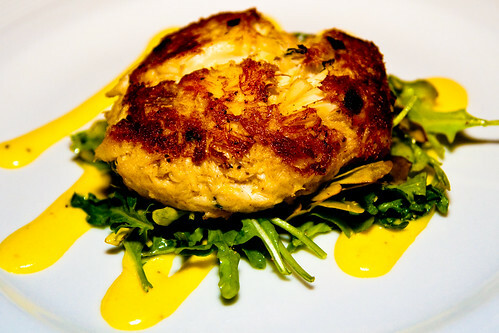 I am a slight crab cake snob having been a former Marylander, but I thought Braddock's did a pretty good job with it. The lemon aioli added a nice touch. 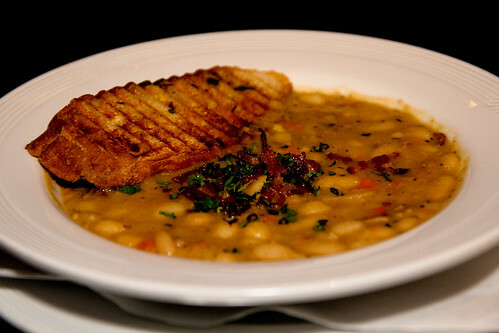 R. also wanted to try the side item White Bean Cassoulet. It was like a stew topped with bacon, and quite hearty and substantial for a side. I wasn't initially too crazy about the choice being not a bean person myself, but I had a couple of bites of this and I'd have to say it was pretty tasty. Another favorite from our last visit that we got again this time was the Housemade Potato Gnocchi & Lobster, for which we had a choice of either a half order ($18) or a full order ($24). We went for the half order, considering we were ordering a lot of food overall, and even the half order was quite filling. 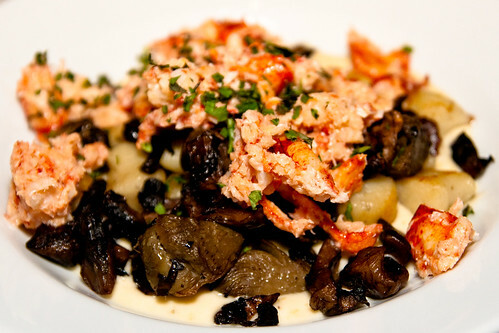 As you can see from the photo, there was no skimping on the lobster, the potato gnocchi had a fresh chewiness to it and the mushrooms supplied a nice contrast in texture. We were actually really full after all this food; in fact, I had to take half the gnocchi and lobster home. But we just couldn't refuse dessert! We decided to share a Warm Fudge Brownie, described as "banana marshmallow fluff, cognac carmel (sic), candied walnuts, & French vanilla ice cream." And boy, was this delicious! I think the dessert ended up being the highlight of our special celebration here. The brownie was actually more "cookie" than "cake" in texture, so it was a bit like eating a warm, oversized soft cookie, which was perfect because I prefer cookies over the typical brownie anyway. What was interesting was that every bite of the chocolatey brownie also had a strong but pleasant almond flavor, which was a surprise as this was not described on the menu, but Christina verified that almond extract was indeed an ingredient in the brownie. 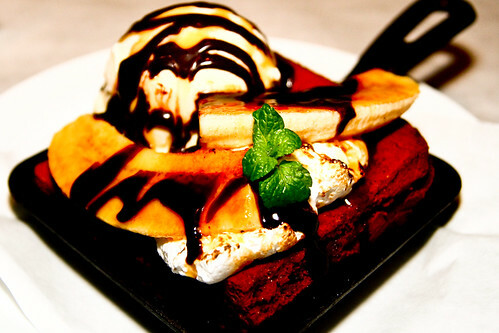 If you like almond, you will really like this brownie. We may have already been stuffed, but we certainly made sure we finished this amazing dessert. In sum, it was another highly satisfying meal at Braddock's. Sometimes hotel restaurants get a bad rep for not delivering the caliber of food to match the high price, and while Braddock's isn't cheap eats for sure, I do feel that the food is worth the money (which isn't astronomically high either). That's why I am very surprised by some of the negative reviews I have seen on Urbanspoon because they are so contrary to the experiences I've had. From what I can gather, it seems there was a cluster of five bad reviews all written within one week of each other (most written on the same day) in October 2010, and another cluster of three from December 2009, so it is possible that they had a few bad days there that prompted the negative response. There were also several reviews complaining about the service at Braddock's. For what it's worth, while I realize that two visits can hardly be considered a representative sample, I have had great service not just from Christina, our server, but also from everyone else at the restaurant - the person who made sure our drinks were always filled, the hostess, and the manager who stopped by to greet us. It is a shame that some did not have a good experience at Braddock's, but it is a restaurant that I would encourage anyone to try and judge for themselves. I certainly enjoyed it. 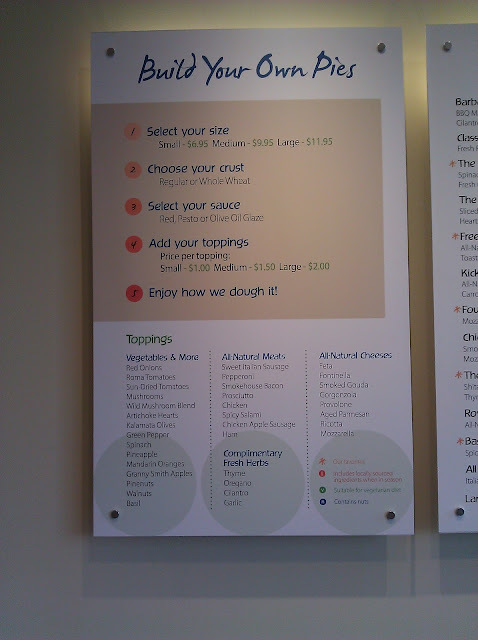 UPDATE 12/2/2011: See my newer post on Braddock's. On my first visit I had wanted to try the Mexico, but was told that the avocados they got that morning were subpar so they weren't able to serve guacamole that day. I had been really excited about the Mexico, but I was glad that at least they cared about the ingredients they used. So instead I decided to go with the New Yorker, with sauerkraut, vidalia onion sauce, and brown mustard, paired with Franktuary's locavore frank - organic, grass-fed, all-beef frank from a farm just an hour north of Pittsburgh in Volant, PA. The frank was really, really delicious: Thick, juicy, and full of flavor. 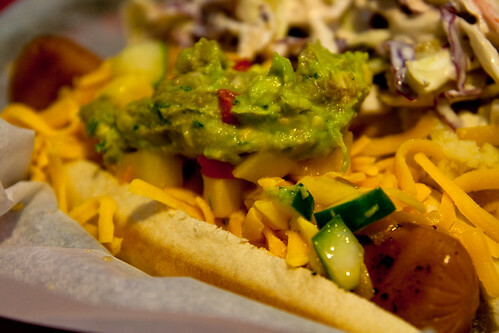 I'll admit I'm actually not normally a huge fan of hotdogs, but the locavore was the bomb. 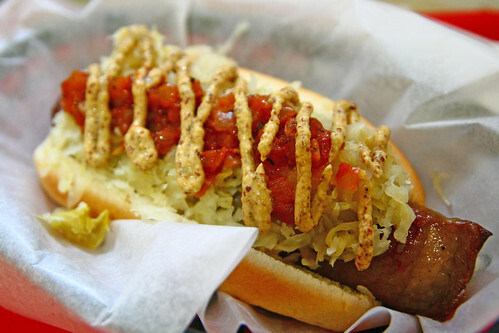 I have also never had sauerkraut on a hotdog before and I liked it a lot more than I thought I would. The hotdog itself is not very large, so for a more fulfilling meal, most people would probably want to get two franks or at least a side to go with one frank. A couple weeks later I once again found myself in downtown Pittsburgh right around lunch time, and I knew I just had to go back to Franktuary. This time, I ordered two Gourmet Franks: 1) The Mexico with cheddar cheese, mango pineapple salsa, and guacamole on top of a Vegan Tofu Frank - because I really had to have the Mexico this time and I was also curious about tofu frank, and 2) The Pittsburgh with smooshed pierogie, cole slaw on top of a Locavore frank - because I had to have the locavore again and because I just had to try the Pittsburgh style at least once. I liked the guacamole and the salsa toppings on the Mexico. The vegan tofu frank itself was...interesting. It actually had the texture and color of a regular dog you might find commercially packaged at your local supermarket, but only with a slight tofu taste instead of a meat flavor. I think it could be great with a little seasoning. 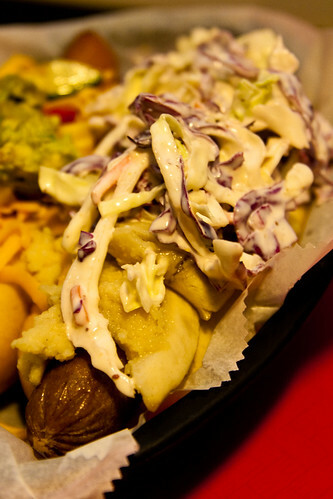 But if you're not restricted by a vegetarian diet, the tofu frank is really no competition for the locavore. Once again, I was impressed by how flavorful it was. The Pittsburgh toppings were pretty good - better than I had expected, for someone who's not really a huge fan of pierogies and cole slaw (shhh!). The one thing that I feel I should mention, despite the fact that I hate saying anything negative, is that it's a shame the buns they use at Franktuary really don't support the awesomeness that is the locavore frank. It's funny, because during my second visit here I overheard another patron asking the staff about their buns, and their response was that because of space limitations they couldn't steam them in-house. (Sorry to eavesdrop, but I was kinda right there!) I really look forward to the day they find better buns because I really can't say enough good things about the locavore frank, and I think higher quality buns would complete the divine experience that is Franktuary. Update (5/26/2011): Franktuary responded to me via Twitter and said they have been trying out different bun suppliers and hope to find a fix soon. Update (5/27/2011): See Franktuary's blog post regarding their quest for the right bun. I was immediately drawn to the creative Signature Pie options. I placed an order for a medium Chicken Apple Sausage and waited as one of the staff behind the counter hand stretched my 100% whole wheat pizza dough and assembled my pie with fresh ingredients and tender loving care. I'm serious, that's the feeling I was getting from the super friendly staff here. They seem very knowledgeable and passionate about the quality of the pizza, took the time and patience to explain how exactly they make the pies and gave me instructions on how to bake it at home. They checked in with me as I waited to keep me posted on their progress. After about 10 minutes, my shrink-wrapped pizza pie was ready to take home! 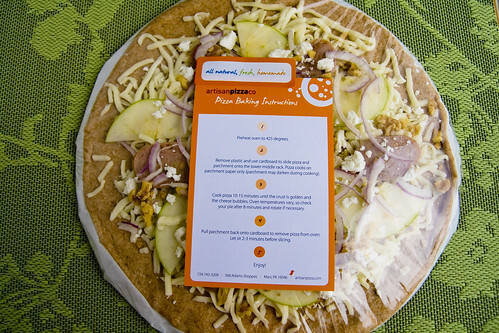 The raw pizza pie is shrink-wrapped for you to take home. 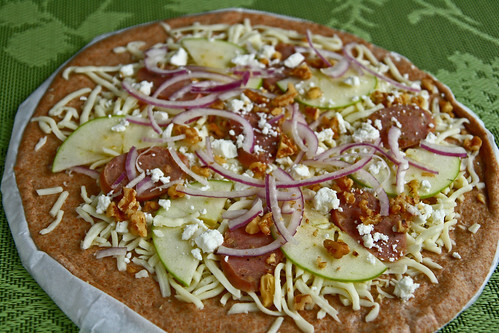 The raw Chicken Apple Sausage Pizza pie. Mozzarella, Ricotta, chopped Walnuts, Garlic, and Olive Oil Glaze. After 12 minutes in the oven: The finished product! 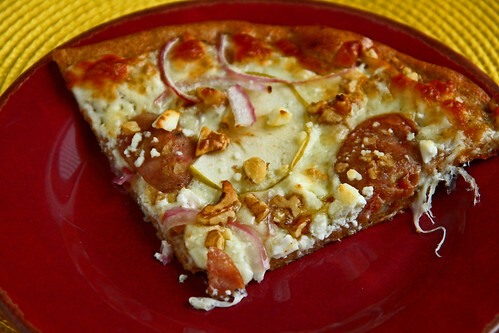 A slice of Chicken Apple Sausage Pizza. So how was the pizza? I was pretty satisfied with it in general. 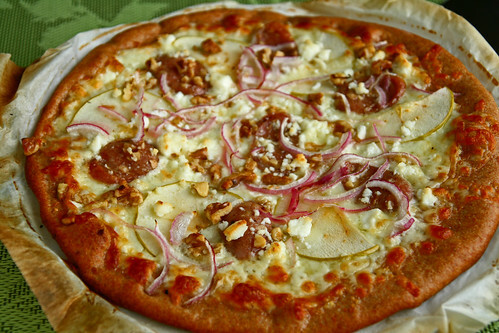 Now, it wasn't the best pizza I've ever had in my life, but it's important to appreciate Artisan for what it is - that it should taste like homemade rather than restaurant-made pizza, so to compare it with what you're used to at top-notch pizza restaurants might not be entirely fair. The 100% whole wheat crust does taste very wheaty, which is something the staff at Artisan had helpfully warned me about and that I knew I wouldn't mind, but if you're not into the wheat taste then you might want to go with white crust. The crust itself is thin but not super crisp, though I suspect one may make some adjustments to the bake time to achieve the desired level of crispness. 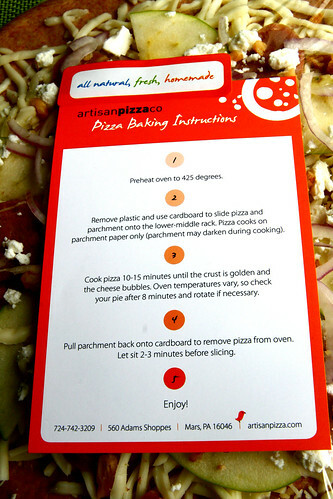 (I had baked mine for 12 minutes, but according to the instructions you can leave it in the oven for up to 15.) The ingredients were good, though I felt the balance was tipped towards the cheesy side, and I didn't taste as much of the Granny Smith apples as I would have liked. The walnuts were a very nice touch though. All in all, I liked Artisan Pizza Co. and am willing to give them a little slack for being brand new. And I do intend to go back if I ever feel like some take 'n bake pizza. I'm generally partial to veggie pizza, so I'm thinking that might be the next on my list to try. Last Friday night I met up with a friend for a quick dinner before a movie at one of her regular hangouts, El Paso Mexican Grill in Bridgeville. Located in the Great Southern strip mall next to TJ Maxx, El Paso strikes me as the type of place that would be great for a really simple, casual meal with your family. Traffic was surprisingly good that day so I got there about 20 minutes early. There was a couple waiting for a booth seat when I got there (those seem to be pretty popular) but I had no preference, so I was seated at one of the tables right away and started munching on warm tortilla chips and salsa while I waited for my friend to arrive. 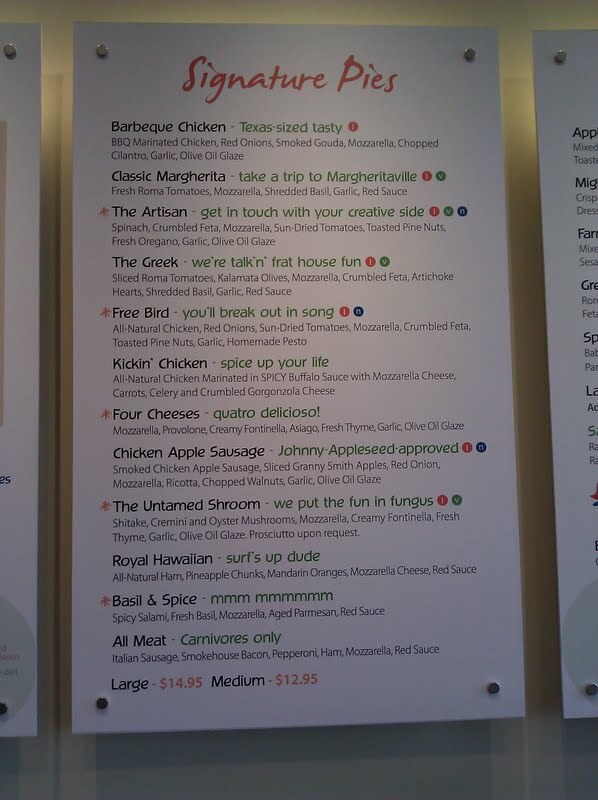 My friend is pretty familiar with the restaurant and ordered one of her stand-by chicken dishes. 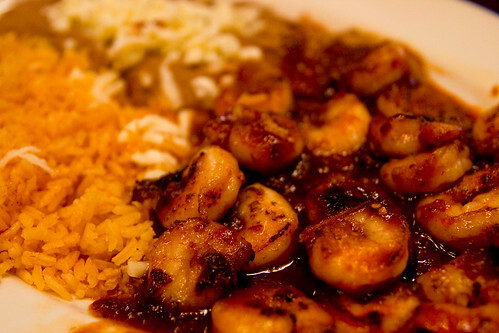 I went with the Honey Chipotle Shrimp served with rice and beans which I thought sounded pretty good. My friend had promised that El Paso would be cheap and decent - and she was right. My shrimp dish was $10.05 and really filled me up. It was pretty tasty, too, for a $10 seafood item. The shrimp was just a tad bit on the overcooked side, but the sauce had a nice amount of sweetness and smokiness and was quite good. It's no fine-dining, mind you, so if you go to El Paso expecting knock-off-your-socks Mexican food, you'll probably be disappointed. But for something quick and relatively inexpensive, this was a good option. 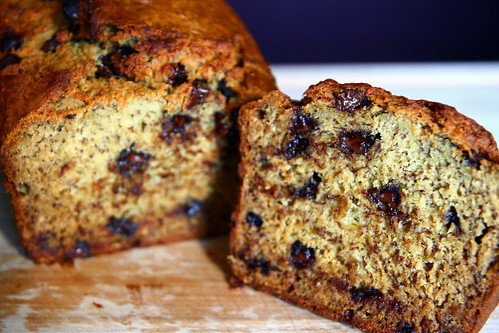 Once upon a time I discovered a fabulous and easy banana bread recipe, chock full of banana flavor (well, it does call for six whole overripe bananas) and moist almost like a cake. 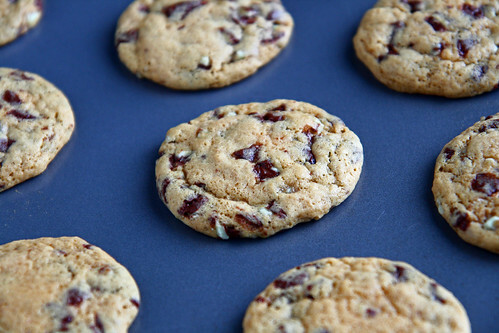 Then one day, I thought to myself, "I bet this would taste so good with chocolate chips!" so I dump some semi-sweet chocolate chips into the batter and I'm happy to report that I have never been more right in my life! Not to toot my own horn (and I can't really claim credit anyway because the banana bread recipe was created by somebody else), of all the times I've made this and of all the people who have had it, I have heard nothing but praise. 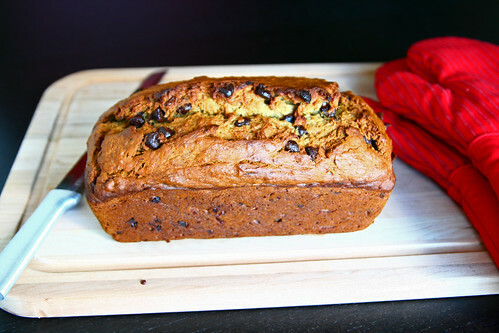 If you want to try this yourself, here's my personal copy of the recipe in pdf format, which is basically the original banana bread recipe with a few of my own changes. 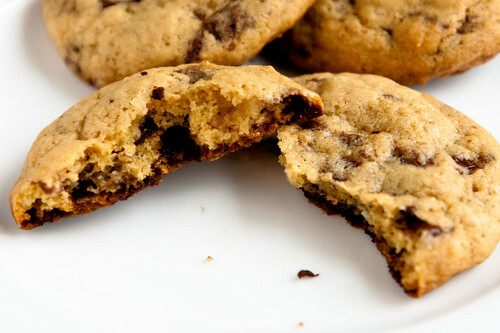 The obvious one: I added 3/4 cups of semi-sweet chocolate chips. Clearly, the amount can be adjusted according to taste, but personally I've found 3/4 cups to hit just the sweet spot. The original recipe does not state how many bananas are needed to make 2-1/3 cups of mashed bananas, and it is actually about six, which is definitely something good to know ahead of time! The original recipe also does not specify the type of brown sugar used. I have tried both dark brown and light brown sugar, and in my opinion it's gotta be dark brown sugar for a full-bodied taste. The light brown sugar is just too subtle for this and doesn't provide the right level of sweetness. Paris 66 - Went there this past week for a food bloggers meetup. I had such a fantastic time and it was great to finally match some faces with blogs! (Shout out to those I met and are reading this right now!) 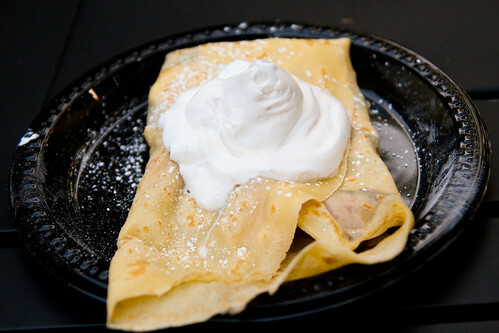 And, I already want to go back for some dessert crepes. Franktuary - Was there for lunch a week and a half ago, loved it, but might go back before I do a post on it because I'm thinking I'll be going back pretty soon. I had wanted the "Mexico" which they didn't have the day I was there, and I've been craving it since! El Paso Mexican Restaurant - Went this past weekend for a quick dinner. Casual, good for the price, blog-mention-worthy. Homemade Chocolate Chip Banana Bread - Was a huge hit at work! Making another one this week. 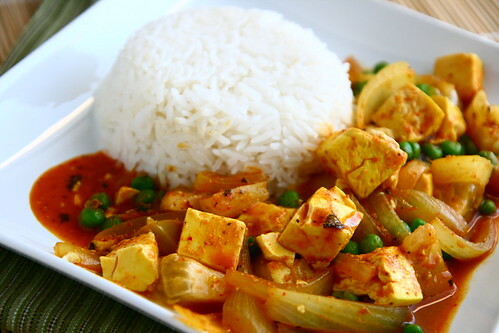 Tofu with Red Curry Paste, Peas, and Yellow Tomatoes - Delicious homemade meal I had this past week. Artisan Pizza Co. - It's a take 'n bake pizza place that I tried for the first time yesterday. Fresh, natural, simple. Tastes like homemade. Zuppa's Deli, take two - I've been back to Zuppa's since my first blog on it and finally tried something new which I'd like to document in my blog, but just haven't found the time. Making ice cream, Jeni's style! Jeni's Splendid Ice Creams at Home will be released on June 15, and you betcha I already have it pre-ordered! I'll be curious to see how the recipes and methods might differ from the Food & Wine feature from a couple years back. What I'm looking forward to doing is not so much recreate Jeni's flavors in my own kitchen ('cause I can just go to Whole Foods and get the real thing! ), but to use Jeni's methods to create my own flavors of ice cream. I have tried it in the past with taro, purple yam, and fresh bananas with success. This summer, I'd like to try taro and purple yam again, and maybe (if there is time) basil; coconut; and some kind of a chocolate-coconut-curry combo reminiscent of an early Jeni's flavor, Coco Curry Cocoa. Making my grandma's signature shrimp balls - the only authentic Chinese dish I know how to make, but hey, it's better than what you get at restaurants. 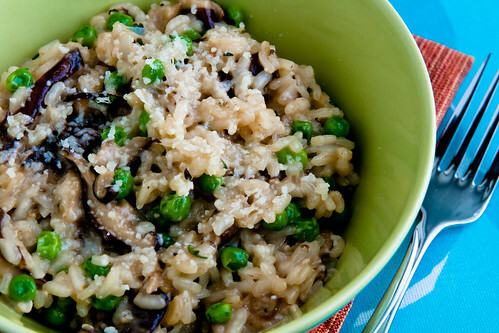 ;) Maybe I can pair them with a lap cheong fried rice that my dad taught me how to make, oh, about a decade ago. Making sushi rolls. I haven't made them in two years and would like to get some practice in this summer. Trying some of Aarti Sequiera's recipes, finally! Continue practicing making waffles with my fancy schmancy George Foreman grill. I've been making them with Stonewall Kitchen's Toasted Coconut Waffle and Pancake Mix and they are so delicious! I'm spending a week or so in my hometown Toronto in early June. It will be a busy trip for various reasons, but I recently started a restaurant wish list for Toronto and I hope to hit at least a couple of those places while I'm there. We'll see. And somehow, I'm going to try and not gain weight this summer. Wish me luck! 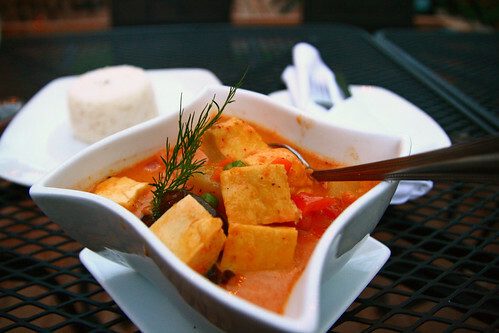 A couple of weeks ago I finally made it to lunch at Spice Island Tea House in Oakland, a little low-key restaurant serving Southeast Asian fare on Atwood Street that has been on my wish list for a little while. They have a pretty extensive menu that includes a number of lunch specials. There were so many choices it took me a while to figure out what to get, but in the end I just couldn't resist the Mango Pork served with coconut rice, which ended up being a great choice! 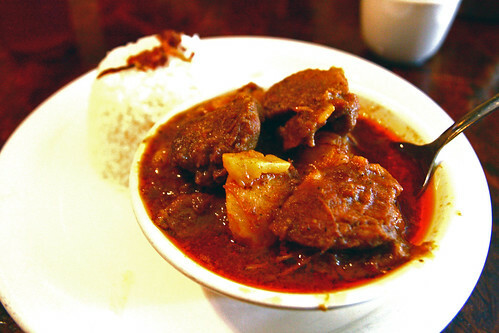 The meat was tender and the sauce was well-spiced if a bit greasy, but that just comes with the territory. My two companions both ordered the Java Fried Rice which seems to be a pretty popular item at Spice Island Tea House. It looked delicious and is definitely something on my list to try next time. All in all, an enjoyable meal with great company! I came across this recipe from a friend's blog a couple years ago and I've been a big fan of it since the very first time I tried it. 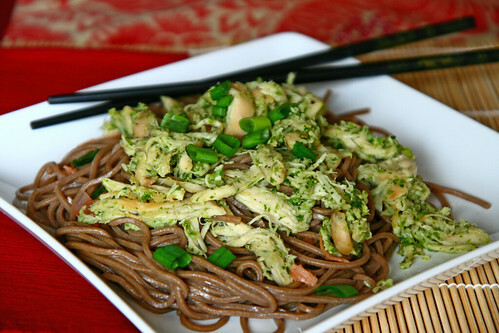 The soba noodles are seasoned with soy sauce, sesame oil, and pickled ginger, which is just a heavenly combo, and I love rotisserie chicken and how well it goes with the honey-jalapeno-cilantro sauce. The ease of preparation wins another bonus point from me! My souvenir from Kansas City was a cold virus that started with a killer sore throat on Easter Monday, so as I contemplated what to cook, I had to be careful to choose something throat-soothing and definitely NOT spicy. I flipped through my recipe collection, and after about ten different and very tempting curry recipes (you think maybe I like curry? 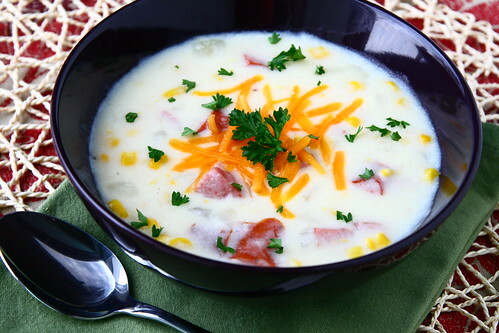 ), I found the perfect solution: Corn Chowder with Smoked Sausage. 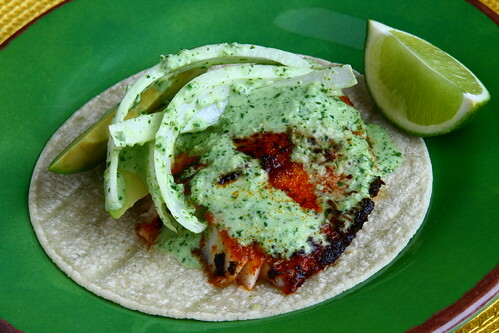 It is creamy, tasty, and easy to swallow without being spicy. It makes for a great comfort food that would be kind to my uncomfortable throat. This corn chowder is super easy to make with just a small amount of preparation involved. I usually don't precook the potatoes but just dump them in along with the milk. It works out pretty well. I have made this with reduced-fat 2% milk before as well as fat-free milk (I happen to have just fat-free milk at home this time around), and I think I do prefer the reduced-fat milk because it makes the soup creamier and gives it more flavor. I have never tried it with whole milk, but it is already very good with milk that has lower fat content, so I prefer to keep it that way. I also find that I don't need to add a lot of salt to this, because the smoked sausage adds quite a bit of flavor and provides a nice contrast from the other, blander ingredients. This is just what I needed.